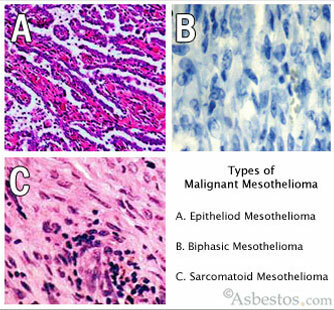 Because it is so rare and caused by exposure to asbestos, mesothelioma is a complex topic. This series of charts and graphics make understanding the cancer easier, including how and where it develops, how susceptible the disease is and common locations for asbestos exposure. 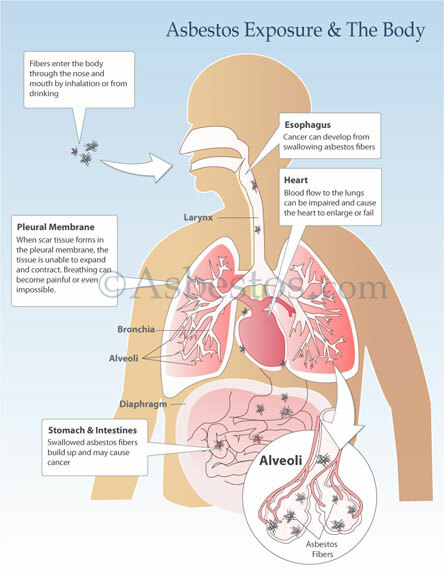 This image demonstrates how asbestos fibers can affect the body once inhaled or ingested. After fibers enter the body, they can become lodged in organs and body cavities, causing inflammation or infection. Over time, this can lead to the development of serious asbestos-related illnesses. In this image, fibers affect the lining of the lungs, abdomen and heart. 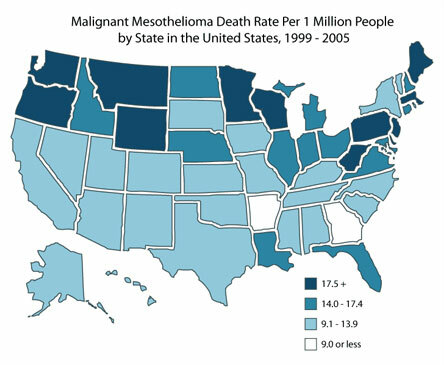 If fibers become lodged in the mesothelial membrane that surrounds these areas, they can cause cells to become cancerous, resulting in the development of mesothelioma. This image details the anatomy of the lung, and specifically highlights the lining of the lungs, known as the pleura, where pleural mesothelioma develops. This is the most common form of the cancer and develops when the mesothelial cells that line the pleura become cancerous and divide uncontrollably. This causes thickening of the pleura, fluid build-up and the formation of tumors which can cause a patient to experience difficulty breathing and chest pains, among other symptoms. This image depicts the effects of asbestos fibers on the membrane lining the lungs, known as the pleura, once they are inhaled into the body. The fibers become lodged in the pleura, causing inflammation and infection. Overtime, this causes mesothelial cells to become cancerous. The cancerous cells then divide uncontrollably, resulting in the thickening of pleural membranes. This can cause patients to experience persistent cough, chest pains and difficulty breathing, among other symptoms. 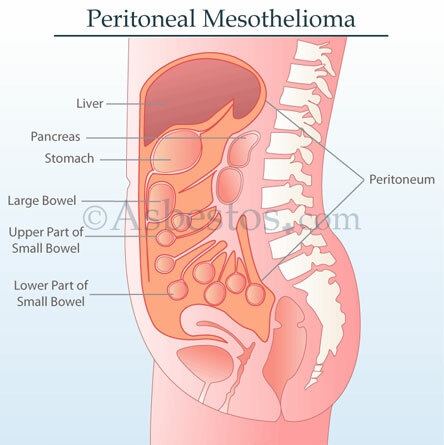 This image highlights the location of the peritoneum, the membrane that lines the abdominal cavity, where this asbestos-related cancer develops. Asbestos fibers, when inhaled or ingested, can become lodged in the peritoneal layers of the membrane, causing cells to become cancerous. The cancerous cells then divide rapidly, causing the thickening of the peritoneum, fluid buildup and tumor growth. Peritoneal patients may then begin to demonstrate symptoms such as abdominal pain or swelling, nausea, night sweats and fatigue. Approximately 2,000 to 3,000 asbestos-related cancer diagnoses occur in the United States annually, and 10 to 20 percent of the patients have peritoneal mesothelioma. This image illustrates the fluid that can develop in the pericardium, the membrane that surrounds and protects the heart. Fluid development can occur after asbestos fibers are inhaled or ingested into the body. In pericardial patients, the fibers become lodged in the pericardium where the body cannot expel the fibers adequately. The fibers then remain in the pericardium for decades, causing inflammation and infection and cellular changes. As cells in the pericardium become cancerous, they divide quickly, causing the pericardial membranes to thicken, which then causes fluid build-up and the formation of tumors. The graph featured in this image represents the amount of malignant mesothelioma deaths that occurred in the United States in 1999, organized by type. There are four different types of this type of cancer, and two types, pleural and peritoneal, are addressed in the graph. 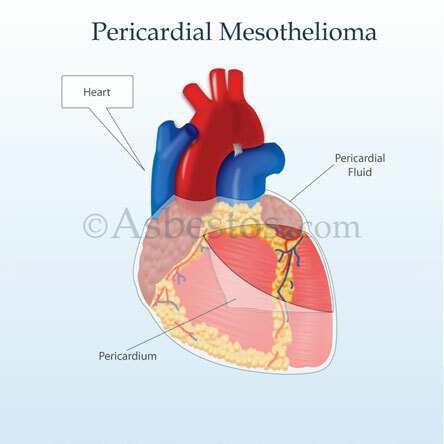 Patients may also be diagnosed with pericardial or testicular mesothelioma, although these forms of the cancer are very rare. This graph details susceptibility per 100,000 people, organized by country. 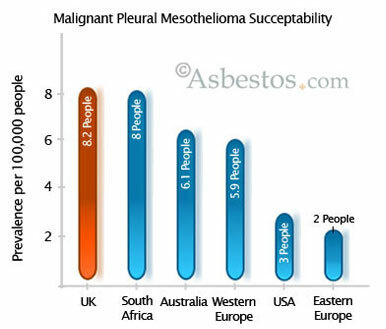 The United Kingdom has the highest rate with 8.2 pleural patients per 100,000 people in the country. It’s the most common form of the cancer, comprising approximately 70 percent of diagnoses. Patients often do not demonstrate symptoms of the disease until it has progressed to later developmental stages which can make diagnosis difficult. 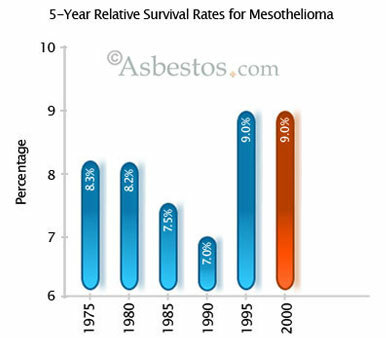 The graph featured depicts the five-year relative survival rate for mesothelioma in five year increments from 1975 through 2000. According to statistics published by the American Cancer Society, today the five-year relative survival rate for patients is approximately 10 percent. Though a cure does not exist, patients may elect to undergo treatment to combat the cancer and improve prognosis. Surgery, chemotherapy and radiation are treatment options commonly recommended by doctors for patients. Those who have been exposed to asbestos and smoke cigarettes have a much greater chance of developing lung cancer. 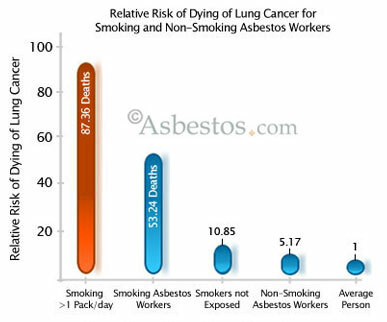 This chart shows the relative risk of dying from lung cancer and the difference in risk for those who have been exposed to asbestos and smoke and those who have only been exposed to asbestos. It is recommended for anyone who believes they have been exposed to asbestos to either avoid or stop smoking altogether. 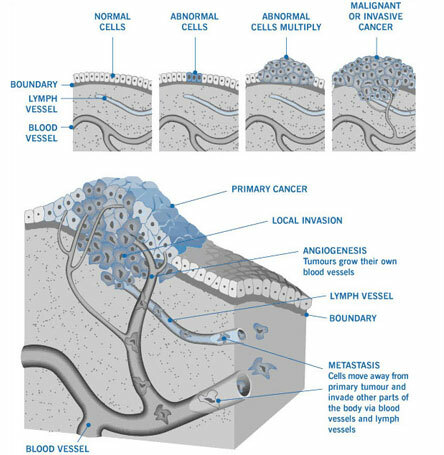 This image displays three separate types of malignant cancer cell structures, including epithelial, biphasic and sarcomatoid. Not included in this diagram is desmoplastic, which is a variant of sarcomatoid type. While approximately 50 to 70 percent of malignant cases are epithelial, sarcomatoid and biphasic do present themselves as common types. 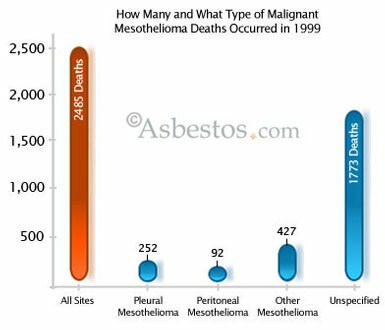 Mesothelioma is almost exclusively caused by asbestos exposure, which can occur by inhaling or ingesting asbestos fibers. This diagram shows the step-by-step process of its development once the fibers have entered the body. Asbestos, a naturally occurring mineral, has been incorporated into thousands of products for its insulating and fireproofing capabilities. 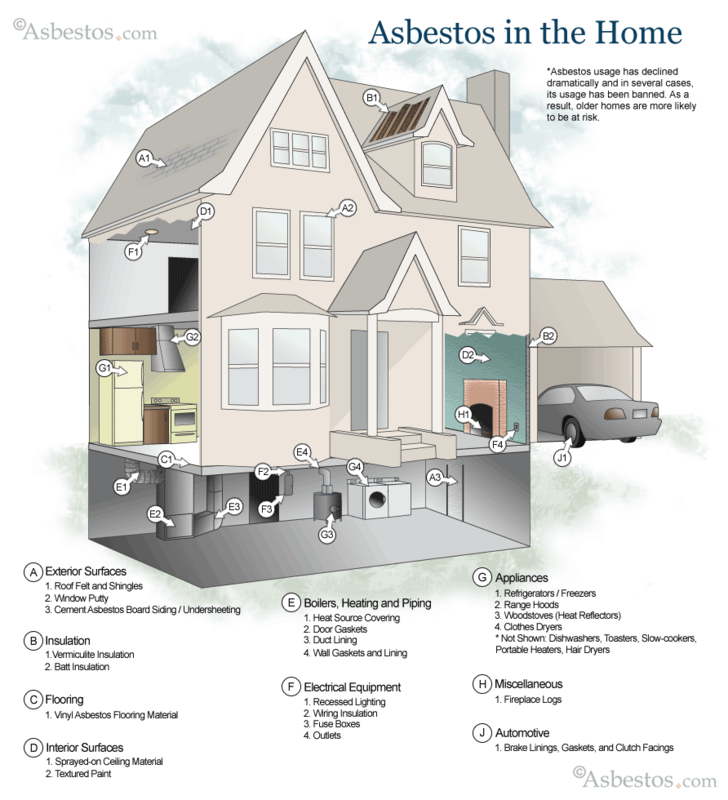 This diagram displays the many different areas where asbestos-containing products were used during the construction of homes. A diagram of asbestos exposure areas in naval vessels. Click the image to enlarge. More than 300 asbestos-containing products were used by the military, primarily by the Navy. Nearly every ship built for the Navy before the 1970s was fitted with asbestos-containing materials to provide insulation and fireproofing measures. This diagram displays the common locations of asbestos on ships and where crew members may have experienced asbestos exposure. The automotive industry has provided one of the primary concerns for asbestos exposure and mesothelioma among occupations. Mechanics may be exposed to asbestos through working with a variety of asbestos-containing parts. 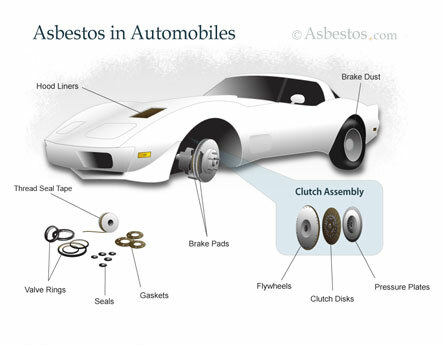 This diagram shows the common locations of asbestos-containing parts on automobiles. Due to the military’s widespread use of asbestos-containing materials, veterans who served during World War II and through the 1970s have a great risk of developing asbestos-related diseases. 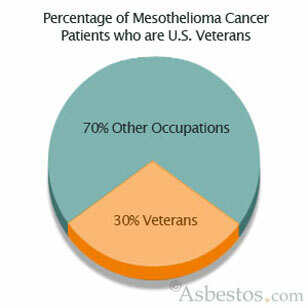 This chart shows the impact that mesothelioma and asbestos exposure has had on military veterans. The United States has been significantly affected by asbestos exposure and associated illnesses. 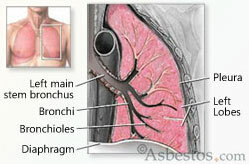 One such illness is mesothelioma, a rare type of cancer that most commonly affects the lining of the lungs. This diagram displays the death rate by state.